Mexican food has become increasingly popular in Sydney lately and it is a cuisine which is particularly suitable for adaptation into fast food. El Loco is one such canteen style restaurant in the foothills of Surry Hills dishing out cheap Mexican fare which is served quickly. 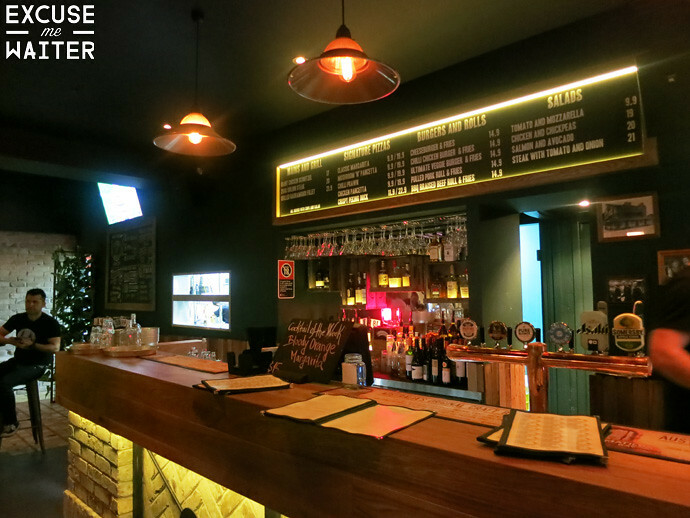 It is hard to believe that this affordable, vibrantly coloured joint is part of the flashy Merivale empire but it is run by Dan Hong who does the lower end of the market very well too – the place feels authentic and is packed when we wander in on a Friday night at 6.30pm. They don’t take bookings so we sit around the counter until a table frees up. Luckily because the food is served up so fast, the turnover of tables is quite quick too. El Loco has done a great job of fitting out the space connected to the Excelsior Hotel on Foveaux Street in brightly painted wooden furniture and wall paintings to create a festive, buzzing atmosphere. It’s a little difficult to sit comfortably on the high stools and hold onto your bag – so try to bring a cross body bag or be prepared to leave your bag on the ground. Onto the food – I’m not particularly hungry tonight so I decide to share a Camaron Taco and Fish Torta Sandwich with a friend. The taco is served in a soft tortilla and is as messy to eat as I expected, but the prawn filling with salsa verde and pico de gallo is bursting with delicious flavours and we gobble it up in no time. We are similarly impressed by the Fish Torta Sandwich which is more like a burger as it is served on soft sesame bun which sandwiches a slice of freshly grilled fish, seasoned with slightly spicy pico de gallo salsa, spring onion and creamy mayo. It is an addictive combination which we can’t get enough of. We’re still feeling a bit peckish after those tasty dishes so we decide to go for their Al Pastor Pork Torta Sandwich too, which features the same ingredients as the Fish Sandwich only a different meat. I actually preferred the Fish version as the Pork was a bit chewier than I liked and I thought the fish absorbed the flavours of the salsa and mayo better. If you like spicy sauces, there’s a few hot sauce bottles available at each table with varying levels of chilliness for you to try out. I really enjoyed our visit to El Loco as it dishes up fun, simple food which is absolutely delicious and very well priced. It’s nothing fancy but a great place to chill out with friends and catch up over some messy finger food and strong tequila cocktails. I am loving the Mexican food boom in sydney at the moment and this looks like another great and cheap place to visit!